In February 2019, Sharon came to us feeling off imbalance, with shortness of breath, tiredness, blocked ears, tinnitus, and thrush including in her mouth and throat. She felt irritable and unable to face stressful situations. “Having tried so many things in the past to alleviate symptoms I felt utterly defeated was heading towards depression. I have been virtually gluten free for over 30 years and lactose free for at least 10 they don’t seem to have been able to sort out the problems. I have had health & allergy issues for most of my life and have been able to pick myself up and get on with Life.” Sharon has joined our 4 month “Heal your Life programme” in the hopes of feeling more alive and well. “Having been on the diet & remedy to eliminate Epstein Barr, Ozone & Rife treatments and the Candida diet plan, I lost 5kg in 3 weeks and this was a bonus. There is a huge improvement to my sinus, post nasal drip & mucus on my chest. I am no longer taking any antihistamines nor using Foxair or asthma pump. I no longer suffer with acid reflux. I was living on Gaviscon & Lansoloc. There is very little oral thrush and I have changed my toothpaste to a herbal one. I have improved concentration levels and more energy. Since following the new diet and ozone/rife therapy, I continue to feel more energetic and my sleep pattern has changed. I have been sleeping soundly for longer periods and not feeling so tired during the day as I was. If I do feel drained, I have an hour’s nap at the most during the afternoon. I haven’t weighed myself recently but last time I did, I had lost another 2Kg = 7Kg in total. I have gone down a size with clothing. The Tinnitus is not nearly as bad as it was, and my right ear pressure is not as uncomfortable as it was.I feel more comfortable in my skin and happier in myself. *Sharon still has 2 months left on the full 4 month protocol. “I have been suffering from severe pain and swelling of my left ankle for more than a year . After several visits to doctors , specialists,MRI scans, sonars and Xrays and thousands of rands later no one had an answer . I could not cope without pain meds , costing a fortune monthly . At one time the swelling and pain was so bad that I had to walk with crutches. Being very skeptical but desperate , I decided to look for alternative treatment. By chance I was introduced to Ozone therapy. I decided to give it a chance I did not have anything to loose . I realised that I was in serious trouble in mid-2015. My health a taken a bad turn, in and out of hospital, could not walk more that 150m without resting, completely out of breath, 3 to 4 asthma attacks daily, my lungs was collapsing fast. Had difficulty getting up and going in the morning and was not really in the mood for life. I was diagnosed with Lupus in my heart and lungs, there was water around my heart and lungs and it was seeping through the walls, flooding the lungs and the heart with too much fluid. I as a result of the medication developed Addison’s disease, and started having problems with my stomach, and so the list carries on. My life was in chaos; my relationship was in trouble my kids were in a mess, I new I had to do something. That is when I spotted a groupon for Allergies, Gillian invited to her workshop. My journey started with Gillian. My first kinesiology session, was dealing with the healing of emotional issues and imbalances, foods that was stressing the body. Gillian sent me to Elize for nutrient requirements and the best of all, alternatives to my chemical medication. After the second kinesiology healing session, I realised just how powerful the corrections for imbalances and releasing of stresses, to my astonishment, my body was ready to start the cleanse process. I started the candida diet on 1st June. The diet was challenging and hard, paid off, within the first week, I stopped my daily antihistamine, to date have not had an asthma attack. Into the 2nd week I had major changes in my relationship. In the third week, in my work life lightened another shift came about for the better. Today my kids are in a better space coping better with life. After my fifth kinesiology session, with Gillian my lungs released like an elastic band coming off and I could start breathing with ease and very little pain, it was as if a whole weight was released of my chest. 3 months later I have lost 15 kg I have come down from 60mg of cortisone to 5mg alternate day, completely off my water pills. I am feeling alive a well and have a drive for life again. I can’t wait to get up in the morning and say hello to life every day. I still have a way to go off the balance of my medication. I am loving my healing journey, will continue with my process with Gillian. Anyone suffering with physical and/or emotional difficulties would greatly benefit from Kinesiology Consultations with Gillian. I started consultations with Gillian after being diagnosed with Rheumatoid Arthritis, compromised liver and bladder functions and Sjogren`s Disease. I have found improvement, relieve and healing of many of my symptoms since. It has also been confirmed by repeated medical examinations. Gillian is blessed with a wonderful skill of intuitive listening and tuning in to one` s ‘inner self’ and has an amazing healing touch as massage therapist. During her consultations she helps you find balance and the connection between body, mind and soul, bringing awareness and healing to all these inter-related aspects. Gillian has helped me make balanced healthy living a way of life and her consultations play a vital role in helping me keep mind and body together, to improve my physical and mental health, living with the auto immune and chronic diseases. It is also enabling me to achieve great results and improvements in competitive sports performances, as well as handling day to day stresses of life and work. 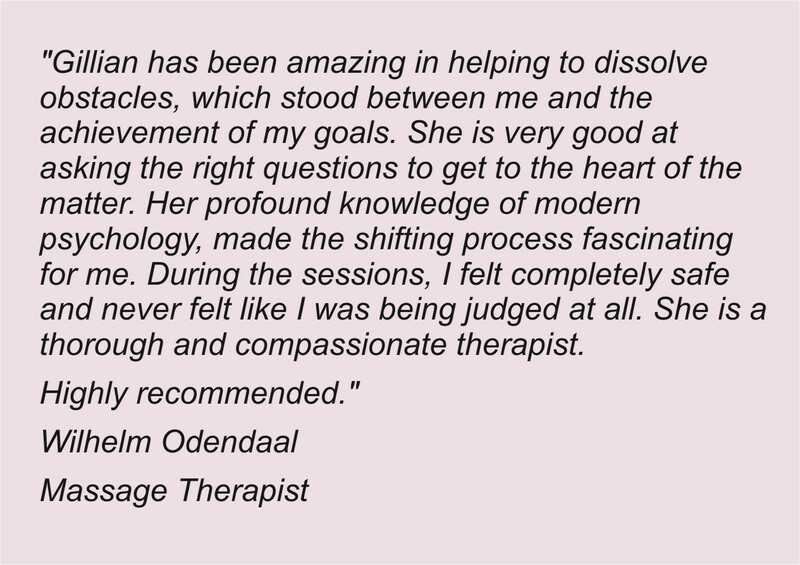 I am very grateful for the supportive role Gillian plays in my wellbeing and strongly recommend her as a Specialised Kinesiology Practitioner. I suffered from chronic utircaria, been to two different physicians, Dermatologist, the gynecologist and no help. Received an email on my groupon messages and said to myself I have nothing to loose let me try this. Since I have seen Gillian, I’m much healthy and don’t have severe breakouts, I’m totally of medications and my skin has improved and I feel brand new and loving myself again. She is genuine and you will feel free with her, she is a pure soul. Thank you for the kind words Michelle I am so glad you are doing so well! I have been suffering from Epstine Bar virus and Yuppie Flu for the last 7 years, been really awful running your own business, stress and lack of sleep did not make this viruses my friends, Thank you so much for all the consultations, balancing my body and soul, teaching me about my acidy, diet etc to improve my lifestyle, the Manatech products, capsules and powder, have boosted my immune system and my energy levels so much that there is no need for Hemogloban injections anymore, after 7 years I have been stable, and can handle my illness and keep it under control! Guys, I can Highly highly recommend Gillian Oshea, thank you very much for being such a great Kinesiologist.